Delicious is going to join GeoCities. Yahoo, what are you doing? Social bookmarking service Delicious is for the chop, it seems: owner Yahoo reckons it's one of its "underperforming or off-strategy products", and that it's not part of the firm's future. So what do you do if you really need to keep track of interesting things you've spotted online? Here are five favourites. Pinboard is probably the closest equivalent to Delicious - it shares a co-founder - and Pinboard helpfully provides a comparison. It's easy to import bookmarks from other services and there's a nifty option to mirror the bookmarks you save with other things, such as Instapaper, or even archive your Twitter tweets. It's not free to join, however, and the sign-up price has increased by ten cents to $8.03 since we started writing this. The price depends on the number of users and keeps the site ad-free. An extra $25 per year gives you archiving, which stores not just links but the pages too, banishing the dreaded 404 Page Not Found errors. Zootool wants to be the place you store everything from URLs to images, so when you hit the bookmarklet you've given the choice of what to store. For example, when we added a blog post we had the choice of the whole page, the images from it or its RSS feed. It's quite nice but will probably be too slow for power users. If you're more interested in storing the interesting bits of pages than their URLs, Evernote may be the service for you. There's a browser bookmarklet - Evernote calls it the Web Clipper - as well as dedicated OS X, Windows, iOS, Android, BlackBerry, Palm and Windows Mobile devices, and it includes handy features such as geotagging of notes and image recognition to turn scanned documents and business cards into editable, searchable text. There are multiple ways to add URLs to Google Bookmarks - there's an iGoogle gadget, you can use the home page, you can do it from the Google Toolbar, you can star a site you see in search results - but the easiest method is probably using the bookmarklet that you drag to your browser toolbar. Beware, though, because batch importing requires the Google Toolbar, which is only available for Firefox and IE. Don't forget Chrome Sync either - it's not ideal for massive bookmark collections but Chrome will happily sync bookmarks between different machines. What it won't do is take those bookmarks and add them to its own Google Bookmarks: for now, Chrome bookmarks aren't compatible with it. If you need to store hundreds of bookmarks it isn't for you, but as a read later service Instapaper is peerless: when you see something you'd like to read later on, just hit the bookmarklet and Instapaper will deliver it to your browser, to your iPhone or to your iPad. 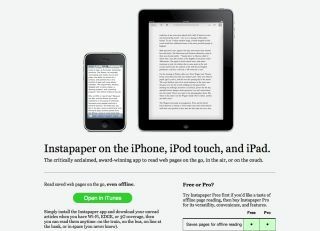 Instapaper even works with the Kindle, although the Kindle option's a manual download. The results are gorgeous, with adverts and other page furniture stripped away.